Imperative and CSRwire bring you The Purpose Economy 100 and the pioneers who are driving the evolution of our economy on a quest for purpose. Imperative and CSRwire today unveiled The Purpose Economy 100 (PE100), a list of the top 100 pioneers shifting the economy to better serve people and the planet. Selected based on their innovative models, philosophies and inventions, these 100 catalysts span a wide array of industries and geographies, all united by a common purpose. The Purpose Economy 100 are the first to research, develop, and shape markets that foster community, personal development, and impact. Inspired by the upcoming book, The Purpose Economy by Aaron Hurst, the PE100 highlights leading examples of a global economy where ‘purpose’ is supplanting ‘information’ as its primary driver. Based on his research, Hurst articulates personal growth, relationships and societal impact as the principal factors affecting the next economy. For Hurst, the PE100 pioneers are living proof of his research in action. “Just as Steve Jobs and Bill Gates were crucial in bringing about the Information Economy, the PE100 will be catalysts of this new phase of the economy in the US and worldwide,” says Hurst, CEO of Imperative. The Purpose Economy 100 cohort spans every sector of the U.S. economy, from startups, corporations and academia to government and nonprofits. Covering nearly 20 industries and almost every state in the US, the list spans from people of great notoriety to emerging innovators. It includes social entrepreneurs such as Patagonia’s Yvon Chouinard and Ben Cohen and Jerry Greenfield of Ben and Jerry’s, to more recent market makers like the founders of Airbnb and Kickstarter. From grassroots community organizers, such as Sara Horowitz of Freelancers Union, to such corporate leaders as Indra Nooyi of PepsiCo. From innovators in government like Fmr. US Surgeon General, Dr. Regina Benjamin, to academic thought leaders like Brené Brown of the University of Houston. This movement undoubtedly extends beyond the United States. Imperative will soon open nominations for The PE 100: Asia and The PE 100: Europe, with the intention of profiling individuals engaged in similarly catalytic work within their respective regions. Nominations will be opened on the The Purpose Economy site on February 10th. “Our research and findings are constantly indicating that this economic shift isn’t only unique to the US - we’re seeing signs of the Purpose Economy across the globe and we’re excited to begin featuring those leaders as well,” says Aaron Hurst. 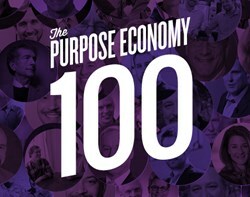 The full Purpose Economy 100 list and supporting resources can be viewed at: PurposeEconomy.com/pe100. The Purpose Economy is a movement organized by Imperative, a career development platform that connects professionals to purpose in their work. Imperative recently released the beta version of its product. Hurst is a globally recognized social entrepreneur and authority on social innovation, as well as a close advisor to a number of global brands, and frequent speaker and writer on the development of The Purpose Economy. He founded and now serves as a senior advisor to the Taproot Foundation, where he was the catalyst and lead architect in developing the $15 billion pro bono service market. The nephew of economist Marc Porat who coined the term “Information Economy,” Aaron began his career in Silicon Valley developing the precursors to social media. He is a graduate of the University of Michigan. CSRwire is a digital media platform for the latest news, views and reports in corporate social responsibility(CSR) and sustainability. Founded in 1999 to advance the movement toward a more economically just and environmentally sustainable society and away from single bottom line capitalism, CSRwire has paved the way for new standards of corporate citizenship, earning the international respect of thought leaders, business leaders, academics, researchers, activists and the media.